In its essence COUNTIF is an advanced version of the basic COUNT Function. Whereas with COUNT you simply specify a range of cells and ask Excel to tell you how many there are, this function allows you to specify additional criteria. You could, for example, ask Excel to tell you how many cells within a range are greater than 4 or contain the name James. How many days is James on call for? How many times is a member of staff expected to be on call for 4 hours or more? Since we already know how to select a range of cells for the first half of the formula, we’ll concentrate on the criteria. Any time you’re not using a cell reference as the criteria for a COUNTIF formula you will need to enclose your criteria in inverted comma – This is true even if you’re using a formula. This is unusual for Excel Formulas and it’s something that often catches people out. 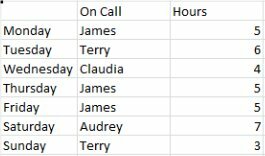 In column C of the above example you’ll see that I’ve included two formulas that are both requesting the same information – How many times is James on call? Clearly the answer is 3, but let’s examine how the criteria have been put together. The first criteria is simply “James”, there is no need to include an equals sign before this criteria. In this case we’re asking Excel to match cells in the specified range against an exact piece of text and tell us how many were identical. In the second example I’ve used a cell reference instead, F6, which also contains the word James. Again there is no need to include an equals sign, and of course the cell you’re referencing against could include whatever text or number you desire. If we apply this to our example we’ll get the answer 2, because only rows 5 and 9 contain numbers which are either less than or equal to the number 4. If you’re still struggling with the COUNTIF Function you might find it helpful to have another look at the Getting started with Excel formulas page.